Discover Wisdom. Open to Grace. Chris’ multifaceted trainings go beyond asana classes by integrating philosophy, meditation, pranayama and asana to serve students who are looking for more than a typical yoga class or training program. Chris serves students who are ready to live, think and be yoga through profound experiences based in authenticity and embodiment. Come for a day of play and exploration. Experience holistic anatomy, from inside. and even the way you see the world. Enquiry: How do shifting perspectives change the way we practice and work? From parts to whole, from external to internal, from mechanical to dynamic. 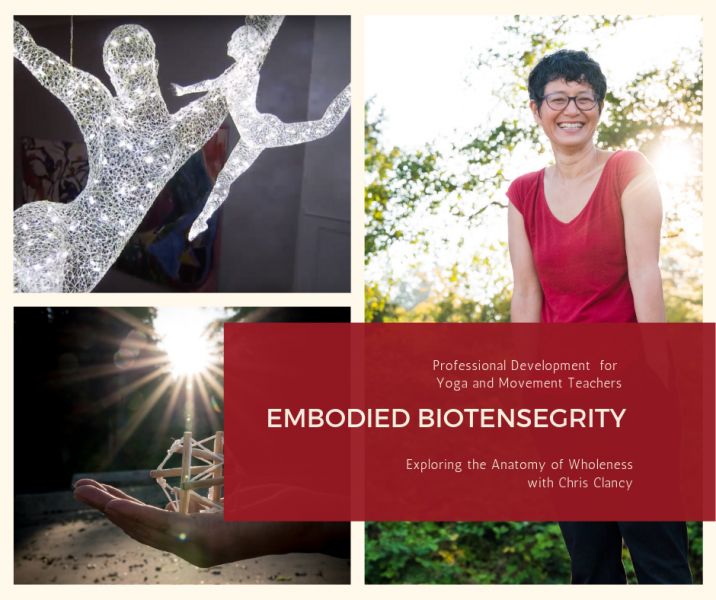 The 40 hour Embodied Biotensegrity Training teaches you the fundamentals of biotensegrity, introduces you to the latest in fascial research and invites you to move from inside to discover new insights into the practicing and teaching of any movement anatomy and modality. In this training, we work within an overarching framework of knowledge generation. We build on the foundations of presence (a state of being alert, aware, receptive and connected), heterarchy (a system of organization where the elements are unranked) and community (we work together towards a common goal). We will enquire into biotensegrity, fascia, and yoga philosophy, and their integration into our individual bodies of knowledge, our unique teaching lives and our personal practices. In the Vijnana Yoga tradition, we move and understand from inside. It is a practice that takes time and dedication to unfold in its fullness. Transform your practice to transform your body and mind. This 90 minute practice is just right for those looking for a way of finding new ease and grace on all levels. Chris is available to teach and speak at conferences, yoga teacher trainings and retreats. Please contact Chris for more information. The Vijnana Yoga training begins by building the foundations of a deep personal practice; we ask our senses to turn inward and cultivate a way of listening, looking, sensing from inside that tunes us to subtler levels of awareness. We learn to touch the silence and stillness that is always present, but so often covered. We experience the freedom and joy of becoming part of a safe, community founded in sharing, learning and growing. We experience shifts in everyday life as the lessons on our mat unfold into our entire being. Once we have established this foundation, we begin the second stage of training: we find ourselves able to express and share the truths we discover in our practice, and the teacher within begins to emerge. From here, we build our tools for teaching and we continue to deepen our practice and inner explorations. The final stage of the training is one of continued exploration and refinement on all levels. Those who have successfully completed the personal practice, attendance and assignment requirements and who embody the Vijnana practice will be invited to partake in a final evaluation with Orit Sen Gupta and Chris in order to be granted an 800 hour Vijnana Yoga International Certification.